Catcher Tiffany McRoy says it’s tough to wear all her equipment. 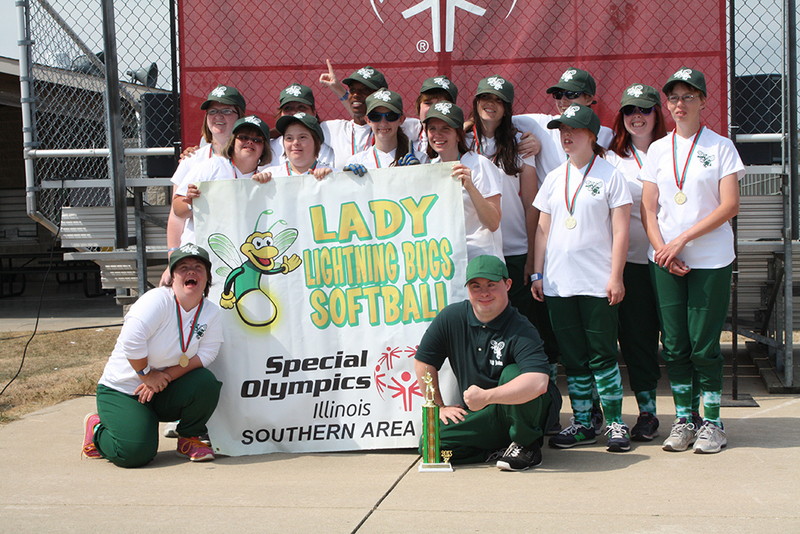 Like the real-life players depicted in the movie “A League of Their Own,” the members of the Lightning Bugs softball team are looking for more females to get involved in Special Olympics softball. 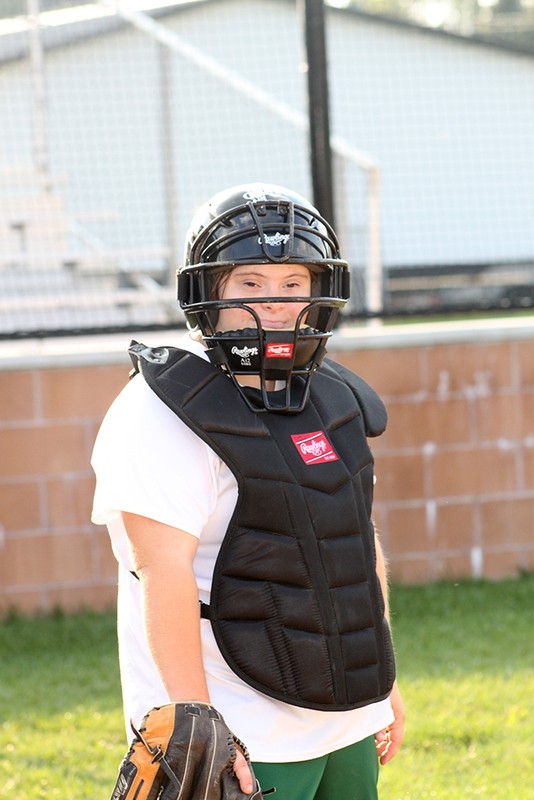 The team, with players all over Southern Illinois, is the only all-girls team competing in softball in Illinois. And the Bugs are looking for more competition. 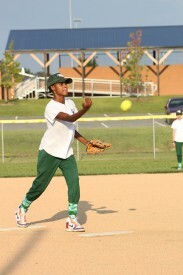 This is the first year for the Lightning Bolts agency to offer softball competition. The agency fielded an all-female basketball team which played in the 2013 State Basketball Tournament. “We were so impressed with the hard work and true sportsmanship of the girls, that we decided to give team softball a try,” said Rich Henley. Initially concerned that they might not have enough female players to field a team, instead “we had girls coming out the woodwork,” Rich Henley said with a smile. So, they decided to split their agency into two teams – one all-male and one all-female. View player cards for each of the Lightning Bugs. Justin Dunning, SOILL Regional Manager of Sports Training & Competition and a former professional baseball player, held a clinic in May for the athletes (male and female) and the “change in skills since then is amazing. It’s more than a bunch of girls hanging out – they’re athletes,” said Rich Henley. The head coach, assistant coaches and athletes trained appropriately, were prepared for their season and competed to the best of their abilities. “Regardless of who they were playing at district competition, they showed up to play the games demonstrating great sportsmanship,” said Melzer. Precedent had been set to advance teams to state in other sports when preferred divisoning guidelines could not be offered. This provided an opportunity for the Lightning Bugs to urge other agencies to create all-female softball teams. “They do it in basketball, so why not softball or other team sports?” said Melzer. The lack of female team sport participation is not a problem unique to the sport of softball or the state of Illinois. On a national level, Special Olympics North America (SONA) has identified this issue as a common occurrence across the United States. SONA has developed a subcommittee committed to grow female team participation in sports, with a focus on basketball. The goal of the committee, composed of various Special Olympics program staff and WNBA professionals, is to develop a proposal and plan to reverse this trend over the next two years, in advance of the 2015 Special Olympics World Summer Games in Los Angeles, Calif.
Pitcher Katrina Valliant switched from left- to right-handed pitching this season. Rich Henley said he has already heard from two other agencies in central and southern Illinois interested in forming all-female softball teams. “This is about the athletes, all of them, learning to compete, but also learning sportsmanship and how to communicate with each other and building friendships,” he said. “Before the Lightning Bugs, these were a bunch of girls with not a lot to do but hang around the house listening to music, playing video games and driving their parents crazy. We keep them very busy, very active and now they are a part of something special. “We didn’t know we were the only all-female softball team in the state when we started,” Rich Henley said. “We didn’t mean to start a big thing, just have some girls playing softball. We were given the option, appropriately so, to play against other all-male or co-ed teams, break up the girls and form two co-ed teams or to drop down to the Tee-ball divisions.” The girls voted unanimously to stay together and play whoever they had to and to do their best. “We adopted a slogan from our basketball team – ‘We may not always win, but we never, ever lose,” he said. The 14 members and 4 coaches of the Lightning Bugs have become not just a cohesive team, but also a family unit. Henley has a fatherly way of coaching the girls that includes comments like “You’re the prettiest team in the whole state of Illinois” and “Thank your moms and dads, sisters and brothers, grannies and grandpa, aunts and uncles and families for their support – 1, 2, 3 … Sparkle!” which is a tribute to the team’s insect namesake. Because the Lightning Bolts is an independent agency, it relies on families for coaching, transportation and fundraising assistance. Coaches Rich and Jane Henley and Bill Asbury all have children participating in Special Olympics. The Henleys started the Lightning Bolts six years ago after their son graduated from Marion High School and had no other way to stay involved in Special Olympics competition. “In Southern Illinois, there are no large park districts or special recreation agencies for kids to go to after graduation. Where do they go?” asked Rich Henley. “We give them a way to stay involved, busy and healthy.” The Lightning Bolts have grown from one athlete to about 40 athletes competing in nine different sports. Coach Rich Henley instructs Jessie Holderfield on proper batting stance. Over the years, the Lightning Bolts have received welcome assistance from numerous coaches and students at the local high schools who volunteer to coach various sports throughout the year. “At first, all we needed was desire, then we just needed cooperation. Now we need help,” said Rich Henley. “We especially couldn’t have done this without the help of our Area Director (Paul Melzer) who directs athletes to us and helps us find ways to raise money for uniforms and transportation,” said Henley. At a recent practice in August, the coaches split duties between action on the field and action in the stands reminding parents of team fundraisers that would be occurring in the upcoming week and urging them to order souvenir T-shirts to wear at the Outdoor Sports Festival in Decatur to support the Lightning Bugs and Lightning Bolts. Rich handles on-field work (“the really hard decisions like ‘Who plays first?’ ”) with Coach Asbury, while Jane does all the behind-the-scenes work like ordering and reordering uniforms, equipment, printing and communicating with parents. 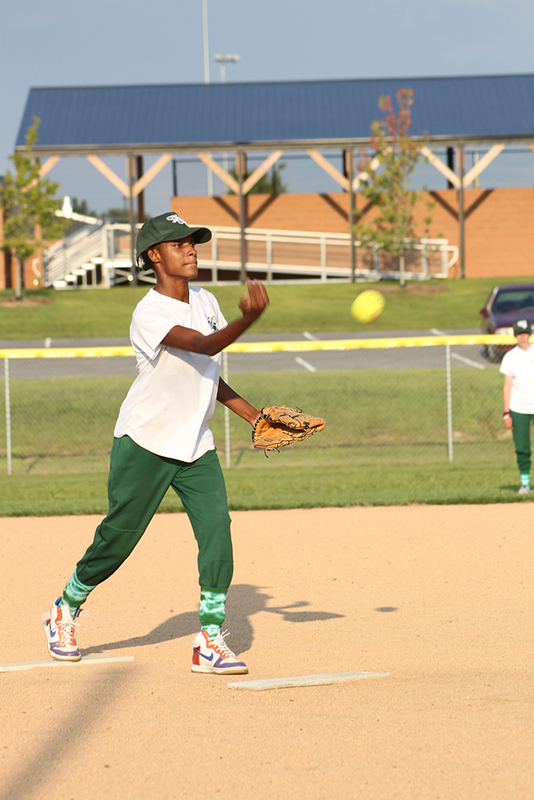 The Lightning Bugs will showcase their talent at the 2014 Girls Fast Pitch Indoor Softball Tournament. The tournament, organized by Coach Asbury, is a yearly fundraiser for Special Olympics and will be at Indoor Sports Arena at the DuQuoin State Fairgrounds.